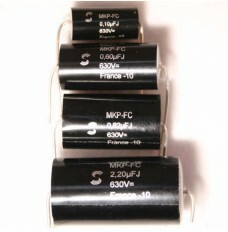 Solen 630V Polypropylene audio capacitors for all loudspeaker crossovers. Solen 630V Capacitors are metallized polypropylene film capacitors offering exceptional value for money. Made by SCR to Solen’s FAST CAP AUDIO Specification, they are specified by HiFi World in their Kits and also used by many top UK HiFi manufacturers. Falcon stocks a full range of 400V types and a large range of 630V types. Both types are extremely suitable for use in loudspeaker crossover networks giving a wide dynamic range and improved sound. Several values are made especially for Falcon mainly for OEM manufacturers.